Turmeric Oil | The Essential Oil From the Healthiest Spice in the World! This is the spice that gives the rich yellow colour and buttery flavour to many sumptuous Indian curries; however, its many health benefits make it much more than just a delightful addition to your kitchen. If you enjoy Indian food then this spice will probably be very familiar to you. If so, I'm guessing you've tried the ground powder and may been lucky enough to have had it fresh, but have you tried turmeric oil? Available at many natural food stores and herb shops, it's a powerful anti-oxidant and anti-inflammatory. The oil's colour ranges from a light yellow to a darker mustard shade, and it generally has a very fresh and spicy aroma. Note: It is not water soluble, and is sold either in liquid form or in liquid gel capsules. 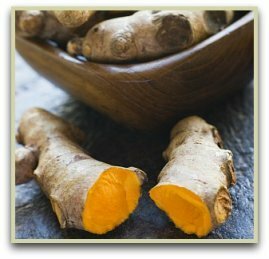 The active ingredient is curcumin, which is drawn out of the turmeric root using steam before it's blended. Click here for general info about this spice. The key to its effective use lies in understanding that this is a very potent product and needs to be handled with care. It must be diluted before use. Note: If you don't have any of the turmeric oil, it's worth noting the fresh root and ground powder also have a ton of therapeutic qualities. Read more about these. Another good way to enjoy it, is to use the powder to make a potent cup of tea. Click for my recipe.